Apparently both my livelihood (work) and pastime (cycling) are riddled with doping link.I can't wait until some professor who is all hopped up on Ritalin powns me in a competition for NSF funding. On a completely unrelated note I went to the local "Wed. Night Worlds" last night. All in all it was a solid 3+ hour ride, with 1.5 of it being during the training race. We had a good group of 25 or so. We ended up whittling it down to 5 of us at the end. The attrition was partly due to the strength of the riders, and partly due to sketchball descending antics by our local MTB hardman Chris. I swear I was sitting on John Rowley's wheel. The "finish" is at the top of a long uphill drag and is not marked. I tried to ask for info about the line but due to tactics or more likely oxygen debt i got no response from my group. The jump came and I was a bit flat footed. By the time I realized that this was a "sprint" and not an "attack" it was too late. I probably didn't have the legs left anyway. It was a fun ride and just the right amount of suffering. I return to racing next weekend at the Poolesville RR. 72 miles of fun on 9 mile loop which included a 1.5 mile stretch of dirt. I can't wait. I just hope I don't break another spoke like at Michigan State last year. 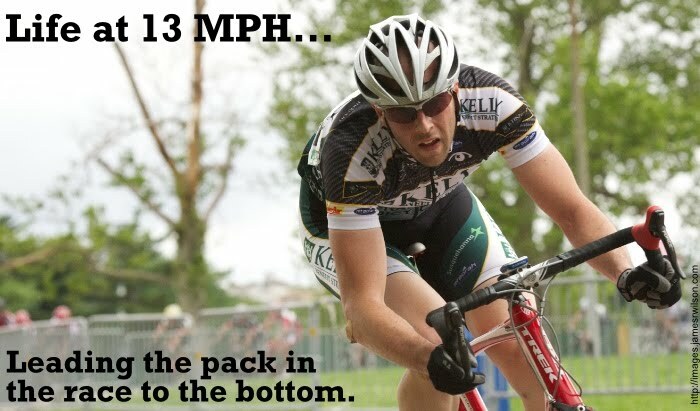 Then again, I'll settle for a third place finish if it takes breaking a spoke. John Rowely. There was a guy that took it to the top and left it there.